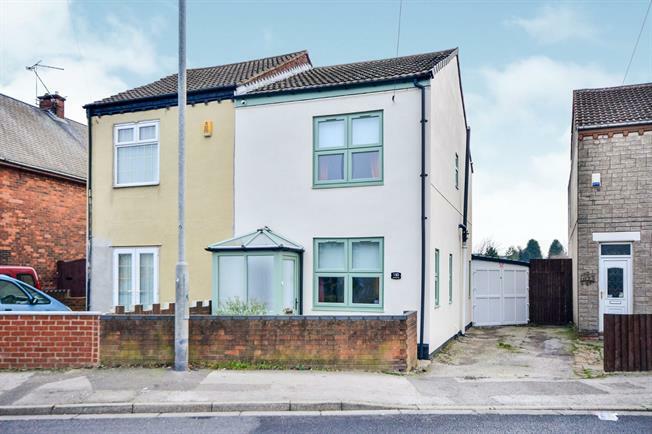 3 Bedroom Semi Detached House For Sale in Nottingham for Offers Over £130,000. Completely renovated three bedroom semi detached house situated in the sought after location of Kirkby In Ashfield. The home is stunningly presented which has been finished to a high standard and would ideal for any first time buyers or a growing family. The home is spacious and briefly comprises rises of; a entrance porch, lounge with integrated sound system, dining room, downstairs toilet, a modern kitchen with utility room and benefits from having a hot tub room to the rear with the hot tub being included in the sale of the house. To the first floor are three double bedrooms and bathroom. Outside to the front of the property is a drive for off street parking which also leads to the rear for further parking. To the rear is a generously sized private garden which has been landscaped including laid mainly laid to lawn, with mature beds, paved and chipped slate section. The property also benefits from having triple glazing, a video security system and secure outbuilding to the rear of the garden. A viewing is highly recommended to appreciate the size and quality of this property. UPVC double glazed door and windows. Double aspect triple glazed UPVC windows. Radiator. Built in sound-system. UPVC French triple glazed door leading out to the garden. Under stair storage. Radiator. Triple glazed uPVC windows. Composite work surface, wall and base units, inset sink, range oven with over head extractor, integrated standard dishwasher, integrated fridge and freezer. Triple glazed UPVC window. Composite work surface, wall units, space for washing machine and dryer. Standard WC and porcelain sink. Radiator. Double glazed UPVC windows. Lantern skylight window. Hot tub. Leading to all bedrooms and bathroom. Triple glazed uPVC window. Radiator, built-in storage cupboard. Triple glazed uPVC window. Radiator. Triple glazed uPVC window. Standard WC, walk-in shower and porcelain sink. Wall mounted radiator.